CHINO HILLS, Calif. – The Camp Transformation Center (The Camp), a national brand featuring fitness centers that focus on inspiring powerful physical and emotional transformations, has earned another national accolade. Entrepreneur magazine has just named the franchise concept to its 2018 “Fastest-Growing Franchises” list, a result of the brand’s growth accomplishments. The Camp is catapulting its presence across the nation through a plan that will significantly increase its footprint by the end of 2018. 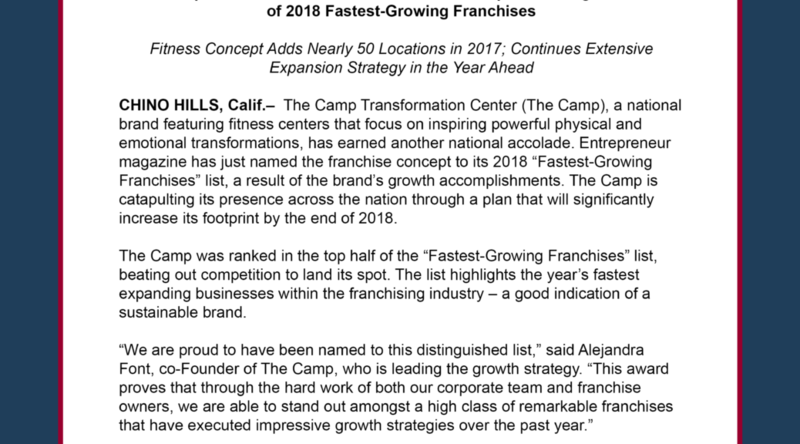 The Camp was ranked in the top half of the “Fastest-Growing Franchises” list, beating out competition to land its spot. The list highlights the year’s fastest expanding businesses within the franchising industry – a good indication of a sustainable brand. Brands on this list are ranked according to the number of new locations added to the franchise system in the United States and Canada from July 2016 to July 2017. Companies with the same amount of new locations between that time period will then ranked based on percentage growth, according to Entrepreneur’s website. Amid the strategy to significantly increase its unit count in 2018, the Southern California-based franchise has nearly 100 locations in 13 states and Mexico. The brand added 42 new locations in 2017 and plans to continue its ascension in 2018. Ideal franchisees showcase an unwavering desire to help people with compassion and empathy. While not necessary, an aptitude for sales is preferred along with leadership skills and a collaborative disposition. The Camp supports its franchisees with proven marketing, sales and operations programs, including a robust opening strategy to fill the initial signature six-week Challenge. Cultivated to attract individuals or teams with an ambition to succeed, strong values and solid community and business connections, the franchise investment offers significant efficiencies of scale for multi-unit investors. Locations are typically situated in light industrial spaces spanning 4,000-5,000 square feet. The Camp blends a positive group training setting with dynamic interval workouts, nutrition and supplement plans and highly qualified trainers. Franchisees drive membership through seven annual challenges. Successful Challengers most often endear themselves to The Camp and become members. To learn more about The Camp, please visit: http://www.thecamptc.com. For more information about available franchise opportunities, please visit: https://thecampfranchise.com. Founded in 2010, The Camp Transformation Center has nearly 100 locations open or in development across 13 states and Mexico. Each gym employs the company’s signature Challenge, a six-week initial entry point for members, which aims to be a transformative moment in the lives of those who join and a launching pad for long-term membership. The Camp Transformation Center is known for its enthusiastic staff members, a clean environment, an open, spacious, and colorful design, nutrition and supplement plans, and fitness training that is motivating and affordable. For more information about The Camp Transformation Center and the franchise opportunity, visit thecampfranchise.com. Expansion is planned nationwide and internationally.